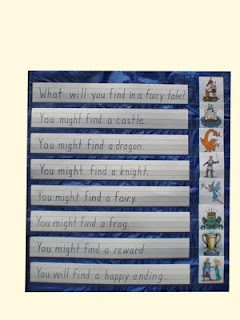 Page 1 - What will you find in a fairy tale? Page 2 - You might find a castle (representing a fairy tale takes place long ago). Page 3 - You might find a fairy (representing the magical events that often occur in a fairy tale). Page 4 - You might find a dragon (representing the villain or bad person). Page 5 - You might find a knight (representing the hero or good person). Page 6 - You might find a frog (representing fantasy, the story couldn't be true because a frog doesn't wear a crown). Page 7 - You might find a reward (representing the problem was solved and the hero receives a reward). Page 8 - You will find a happy ending. I love your fairy tale unit. Do you have it on teacher pay teachers? I would love to get my hands on it!! I a sorry but I do not have all of my ideas put together in a unit. I have been so busy with my dissertation lately that I have not had time for much else. Sorry. I have tried clicking your smilebox and it says it currently unavailable. Does it mean its know longer available to look at? I am back trying to click on your smilebox for fairy tales. Is it available?